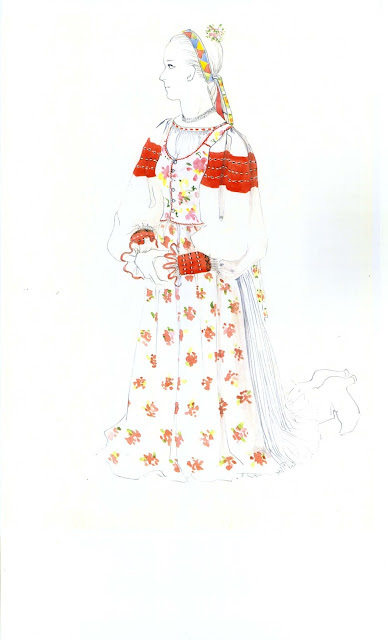 Today I will go into more detail about this costume. This is a continuation of my last post, which was a general introduction. 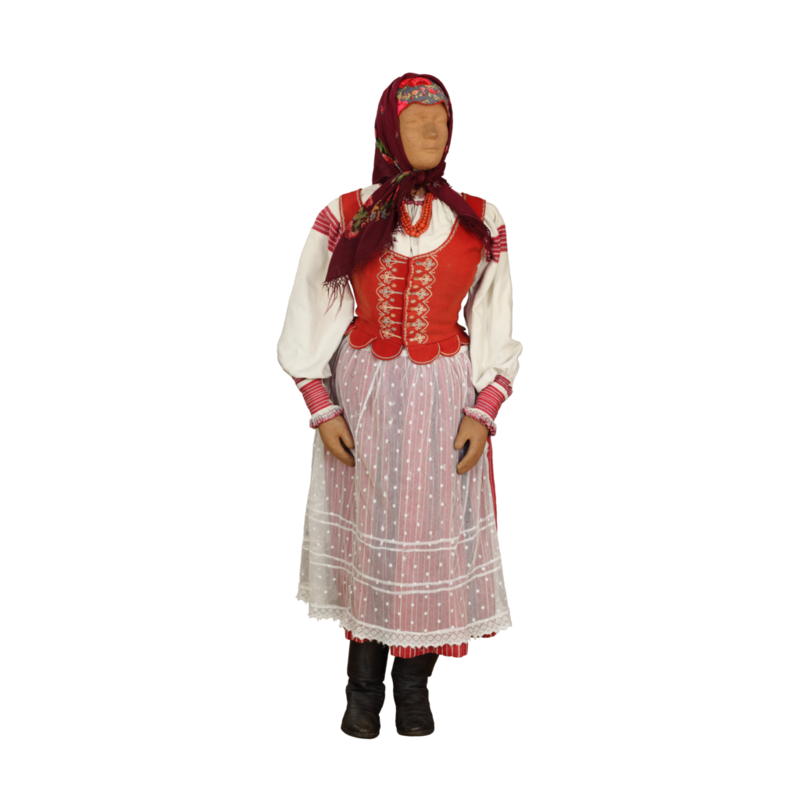 One of the distinguishing pieces of this costume is the woman's shirt, called oplecha. It is made in the 'non-inset' cut, where the sleeves are smock-gathered directly into the collar. 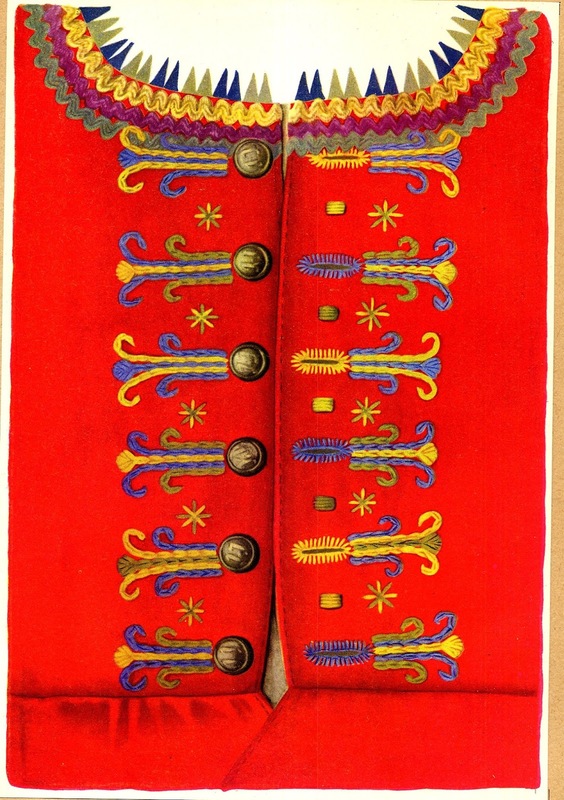 It is woven in linen twill, called in Lemko drelykh, and in Polish treluch, with red ornamental stripes on the upper sleeves and on the cuffs. 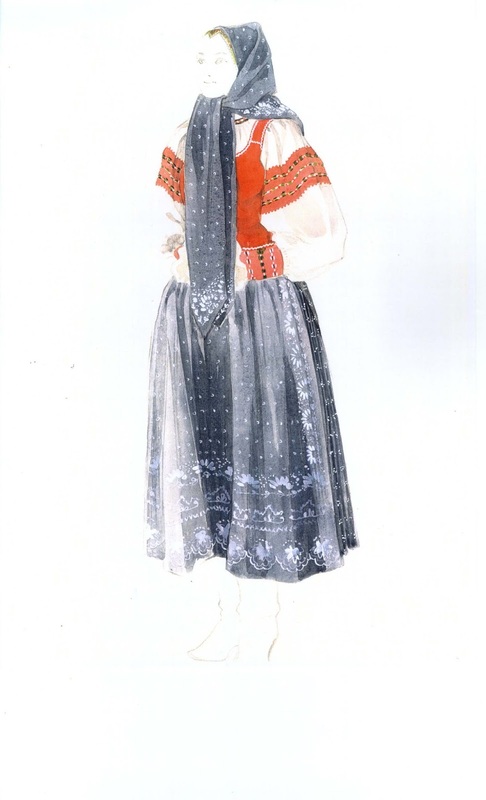 Later the sleeve was made of bought white cloth, and the ruffle became made of lace. 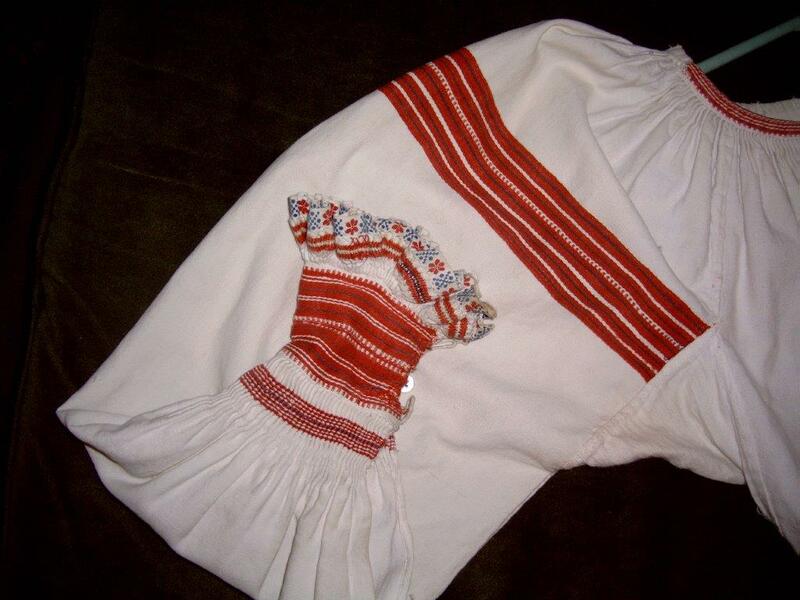 This type of shirt was rather widespread in the region, this example being from the Rusyn village of Litmanova. 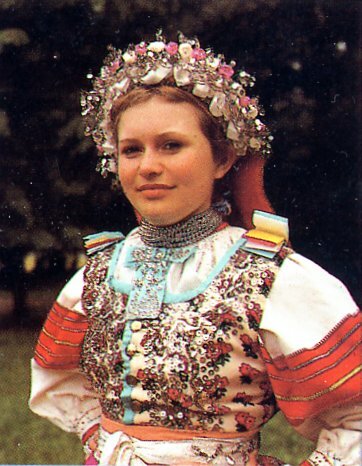 Here is an example of this type of blouse as part of the older Rusyn costume in Slovakia. 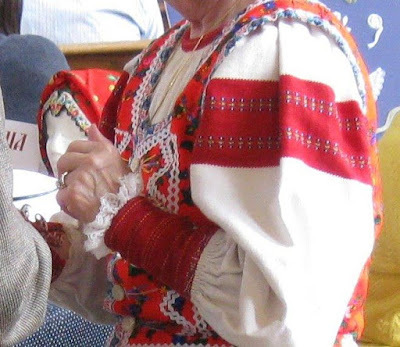 In this area, the costume today generally has sleeves of white damask, but the cuffs are still hand woven. 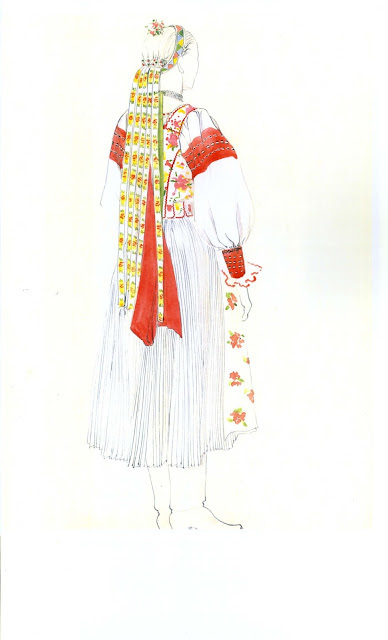 Here is the costume as worn today in Oriabyna - Орябина - Jarabina. 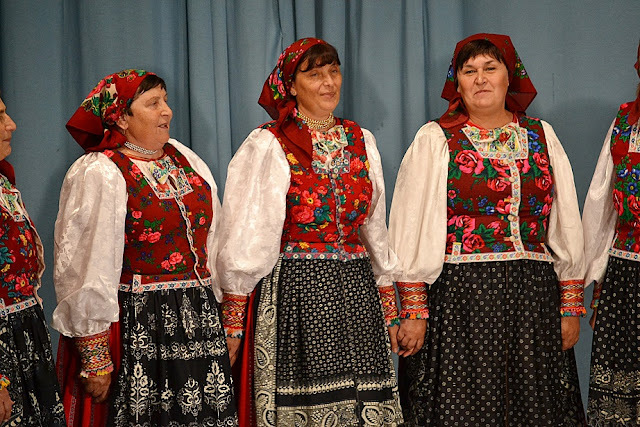 Directly south of the Shliakhtova area are the Rusyn villages of Velykyj Lypnyk and Fil'varok, also in Slovakia. 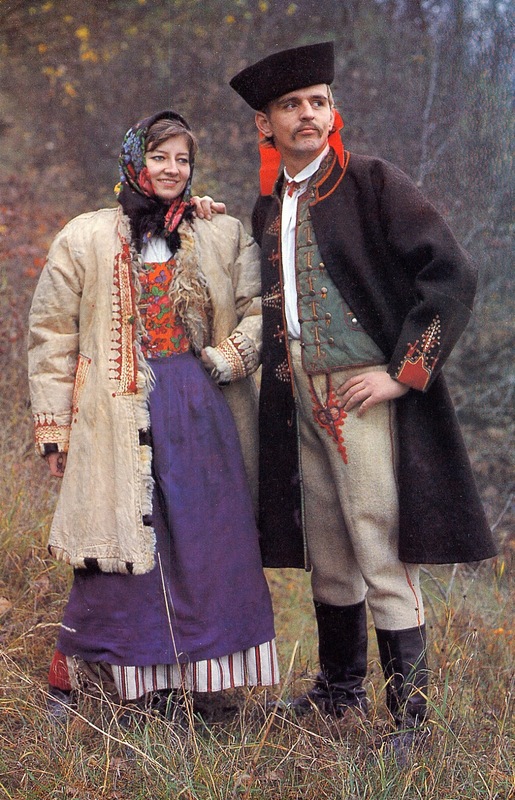 The women share the same costume, but the men do not. 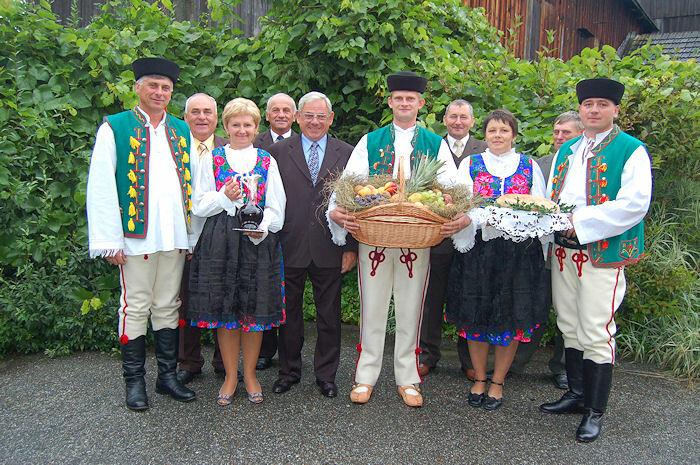 Here is the oplechka of these two villages. 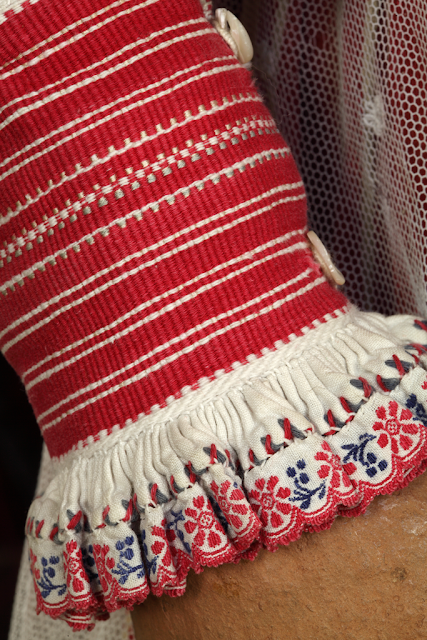 Sometimes today the sleeve is made of damask. 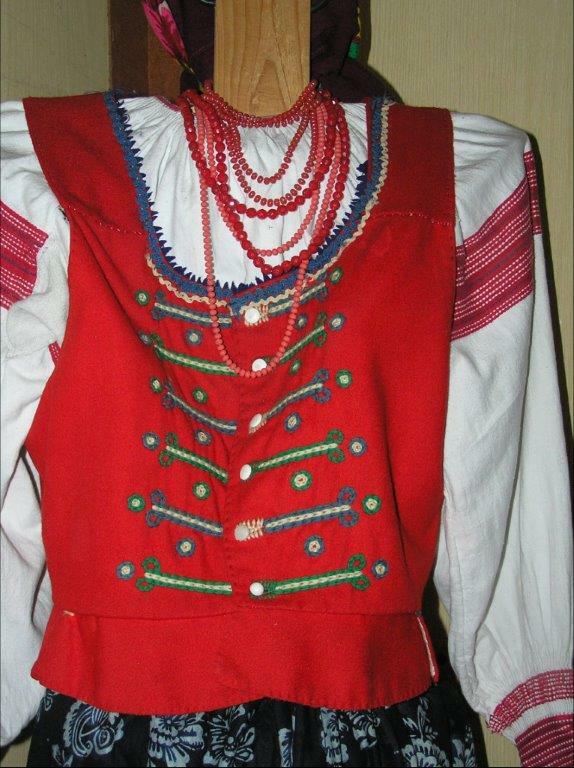 This type of blouse must once have been rather widespread, but has been superceded in many localities. 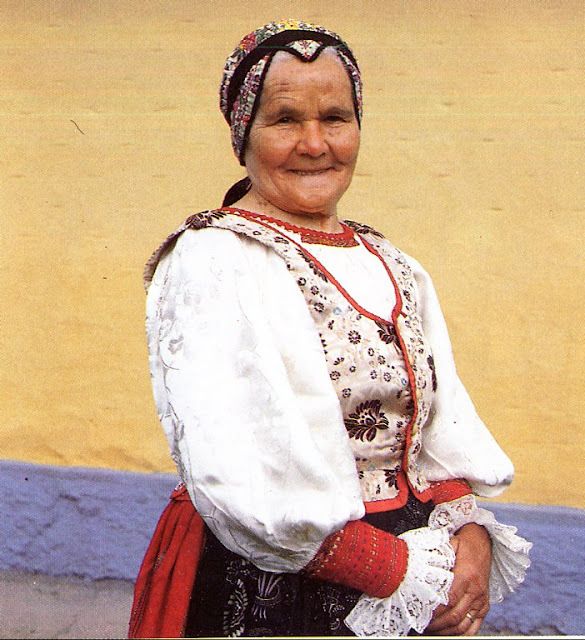 Here is an example from the Slovak Goral village of Lendak to the south. Only the bridesmaids are wearing them in these pictures, the others area wearing newer fashions. This type of oplechko was originally used in the Polish Spisz area as well, Here are a couple of old photos from Trybsz. 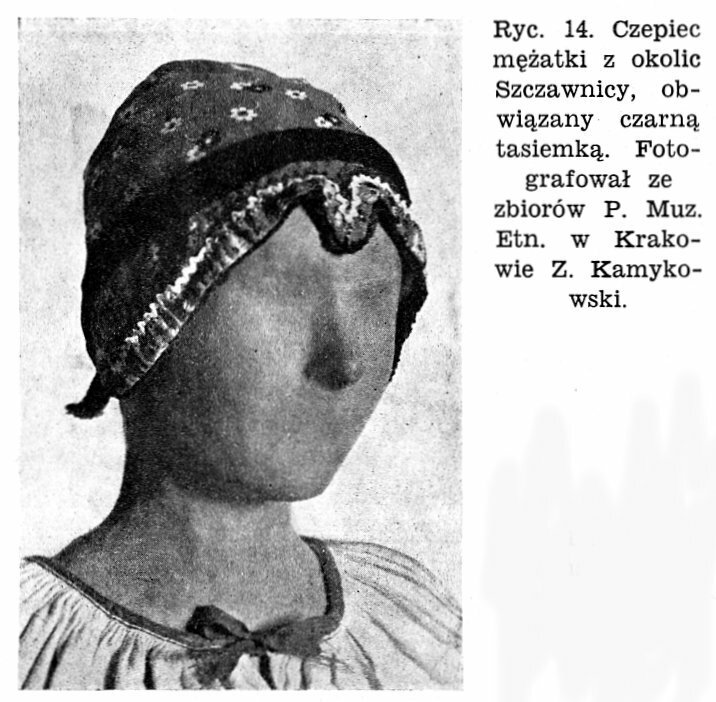 It was even found in the Jurgów area at one time. 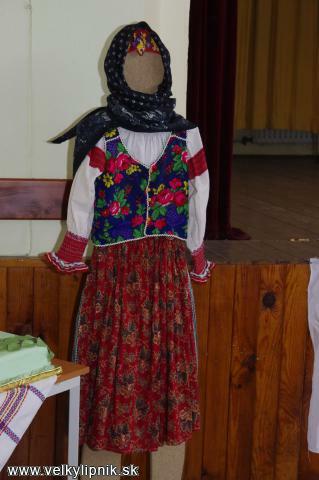 In the Rusyn enclave of Osturnia, this oplechko is also used, although the woven ornament has changed over the years. This is the older version. This is a newer version. 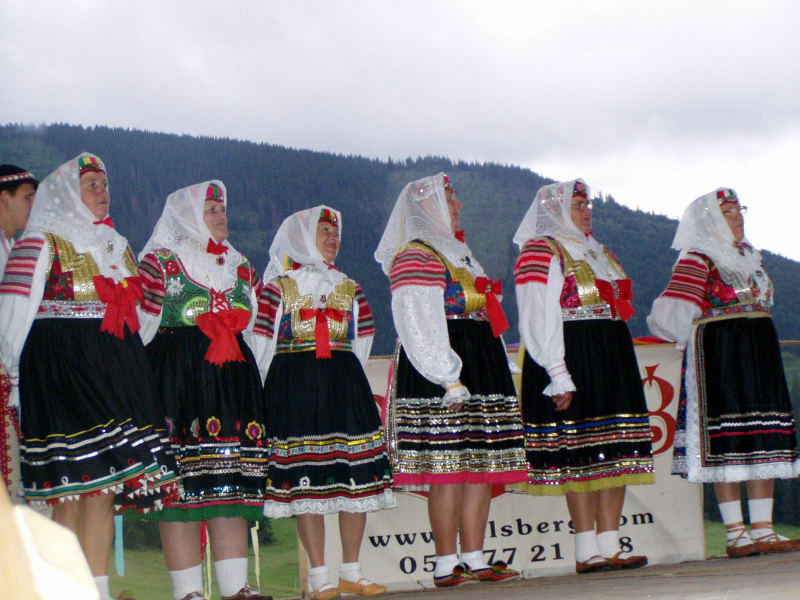 This is also found in the Slovak region around Ždiar. 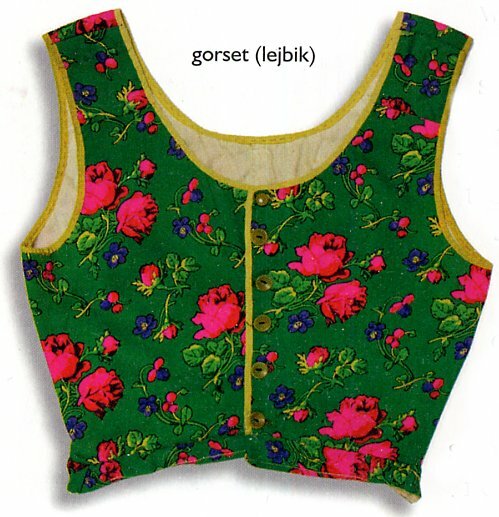 The bodice is similar over much of this region. 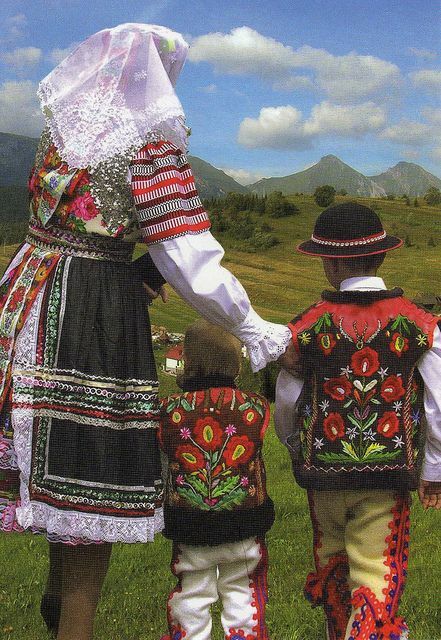 It is called laybyk in Lemko / Rusyn, gorset in Polish, and živôtik in Slovak. It has a rounded neck opening, extends to the waist, and may have lappets or a short peplum, either sewn on, or cut as part of the body. Take another look at the images above. 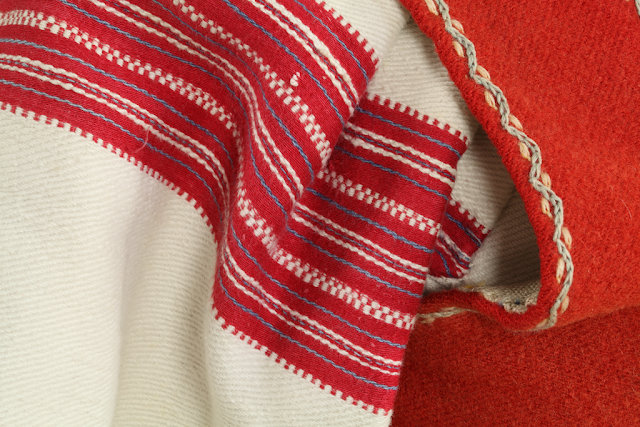 Originally it was made of thin industrially made wool cloth of a single color, known as 'English'. 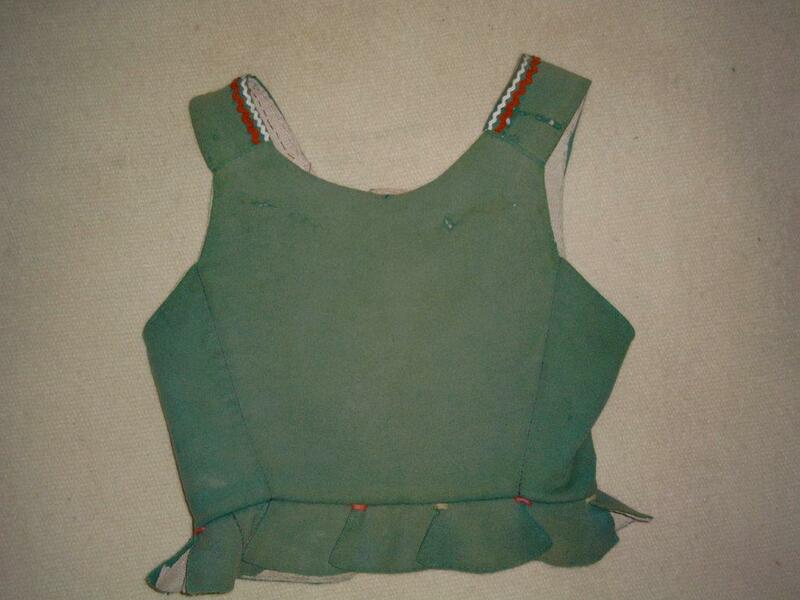 The bodices were often red, green, or black. 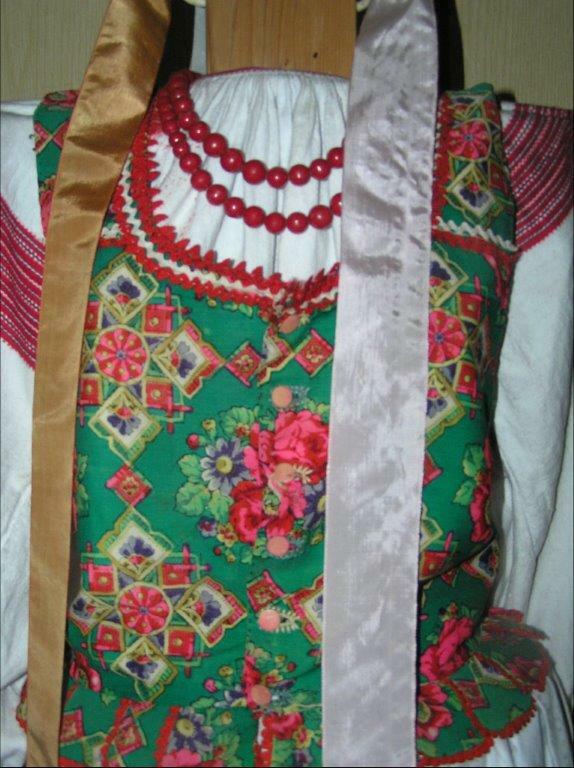 In most of this region the bodice was plain, but in the Shliakhtova - Szczawnica area the front was embroidered. 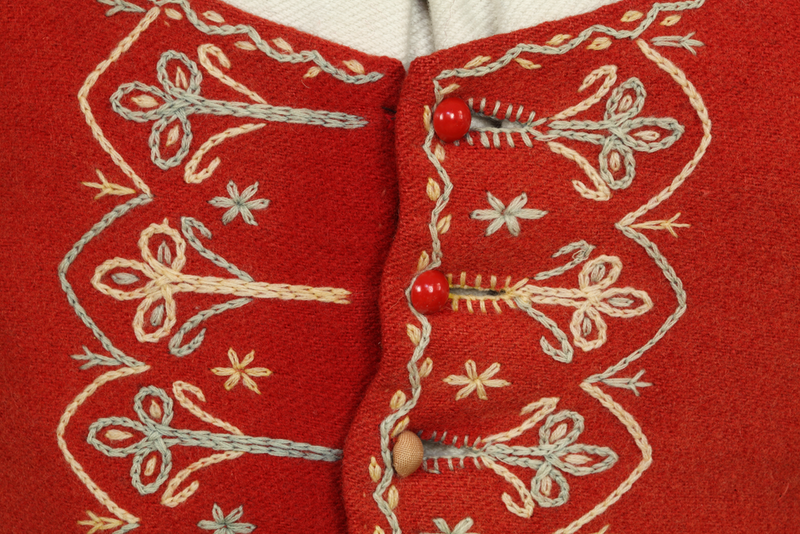 This began with contrasting buttonholes, which were then elaborated, and later extended to both sides. In other areas the front was sometimes closed with hooks instead of buttons. 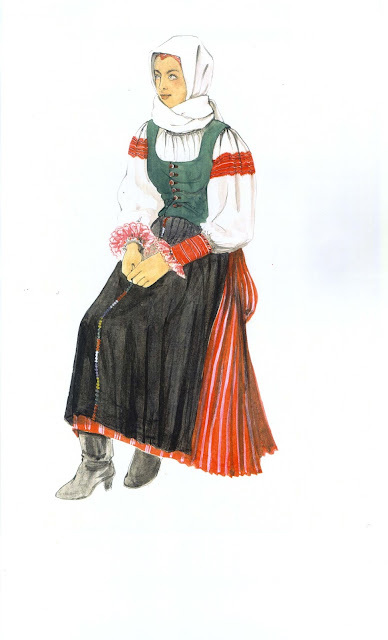 It was sometimes ornamented with trim or embroidery around the armholes, lappets and neckline, and had small 'teeth' cut out of wool sewn into the neckline. 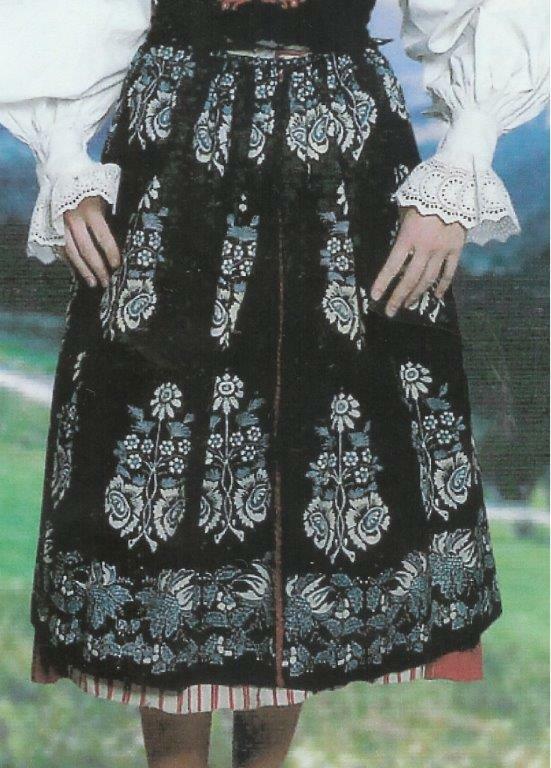 Later the bodice began to be made of flowered print challis wool, which was called 'Tibetan', or of damask or other patterned material. In some areas, such as Litmanova, trim was sewn onto the patterned bodice. This type of bodice was found over almost all of this area. 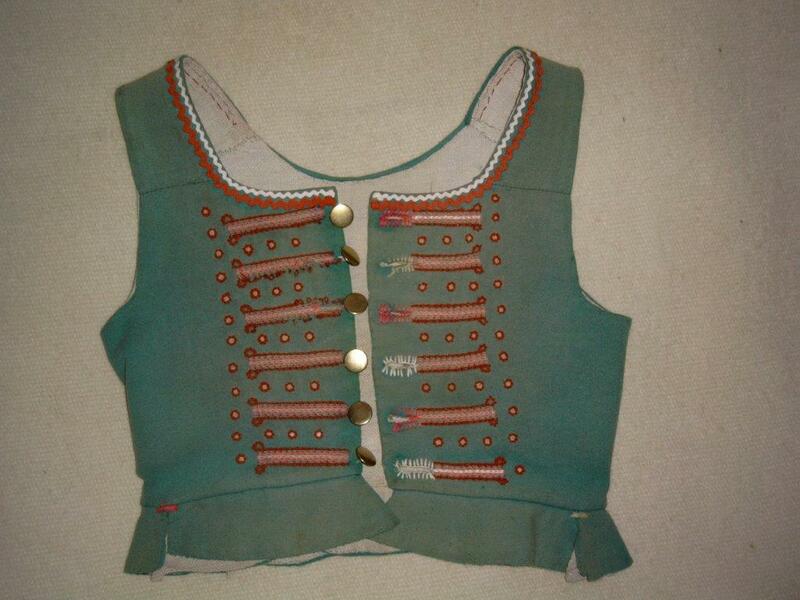 In a few areas such as Jurgow a different type of bodice with large notches in front and back became popular. This was known as 'kabatek', and also became popular in many parts of Spish outside of this immediate region. 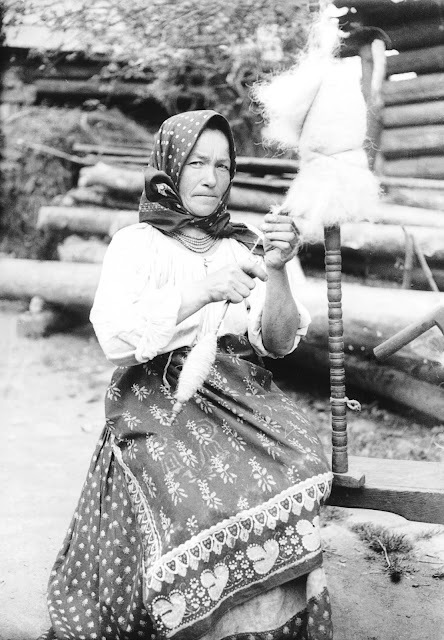 The skirt was called kanafaska, and was densely gathered on the sides and back, and flat in the front. 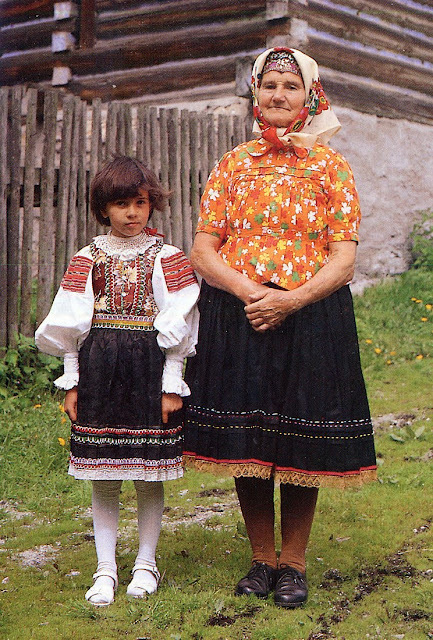 Sometimes it had narrow pleats. Originally it was woven of linen or wool, white with red stripes, or red with narrow white and other colored stripes. Often the panel in front, which was under the apron, was of a cheaper cloth, because it never showed. 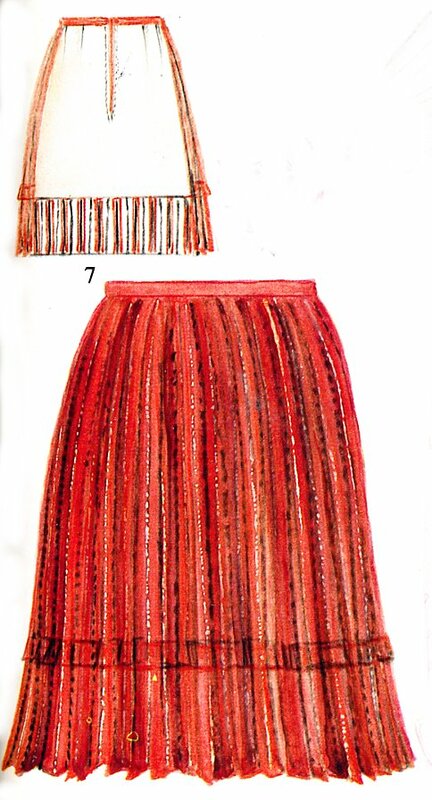 This type of skirt was also widespread in this area. Skirts were also made of solid colored cloth, for everyday often blue, perhaps with a small batik printed pattern. 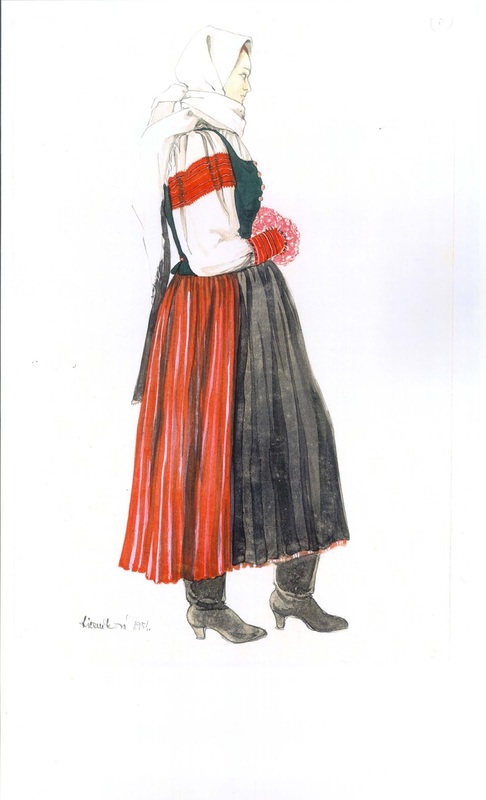 Rose print challis, or 'Tibet' cloth, once introduced also became very popular for skirts. Look over the various images once again. 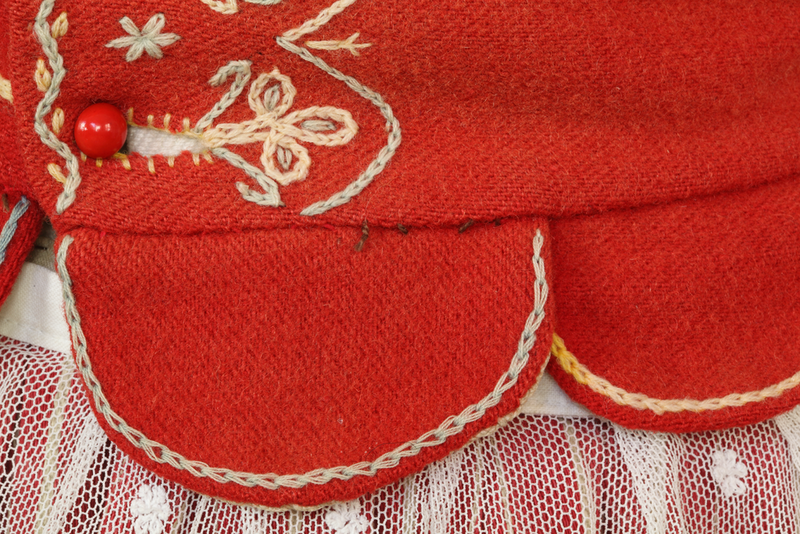 The apron, which was always worn, was made of various types of cloth. They were slightly shorter than the skirts and full. The oldest were a solid dark color. 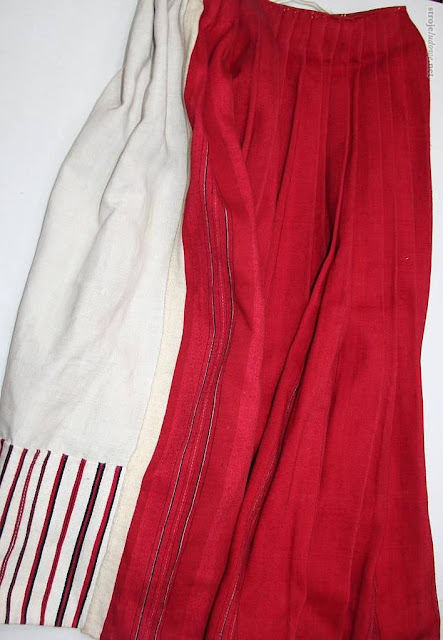 Generally two fields of home woven cloth were used, especially for every day. A couple of examples from Kacwin. 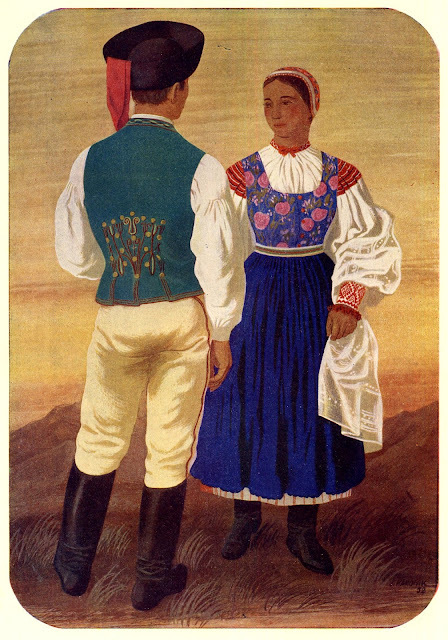 Sometimes the two fields were joined with a colorful decorative stitch, as in this example from Velyky Lypnyk. 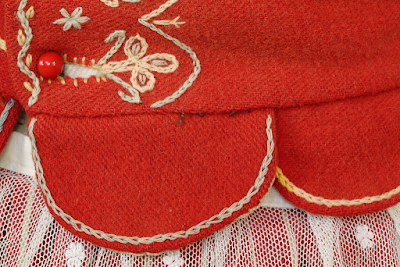 In the Osturnia region the apron continues to be dark with rows of trim applied. Commercially produced bought cloth was used very early for the aprons. Challis or 'Tibet' print was and remains very popular. 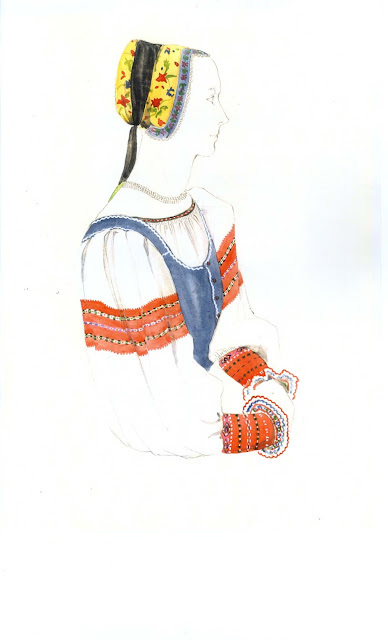 Another example from Velyky Lypnyk. Fine white commercially produced linen with white embroidery, sometimes done by machine, was worn. 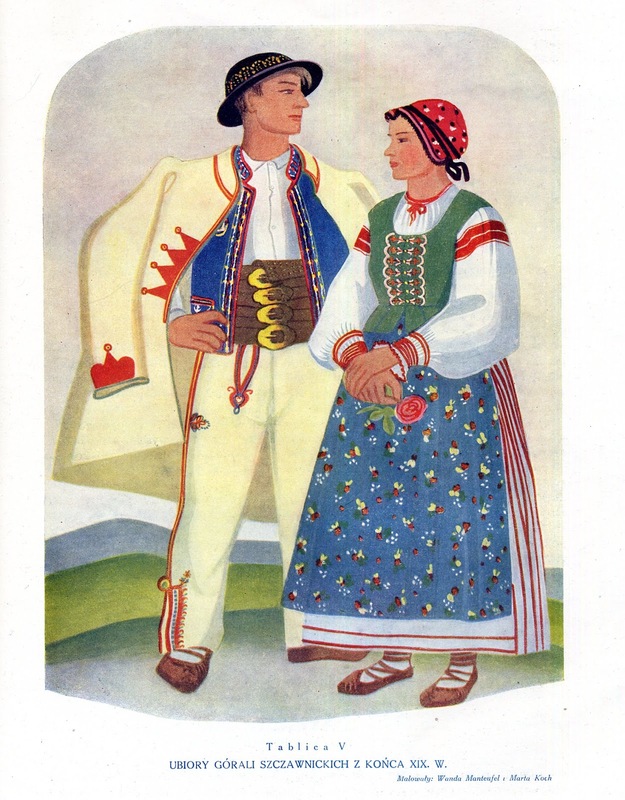 Here is an example from Szczawnica. Later on, when tulle was all the rage, this region was not exempt. Perhaps the most attractive are the indigo batik printed aprons. 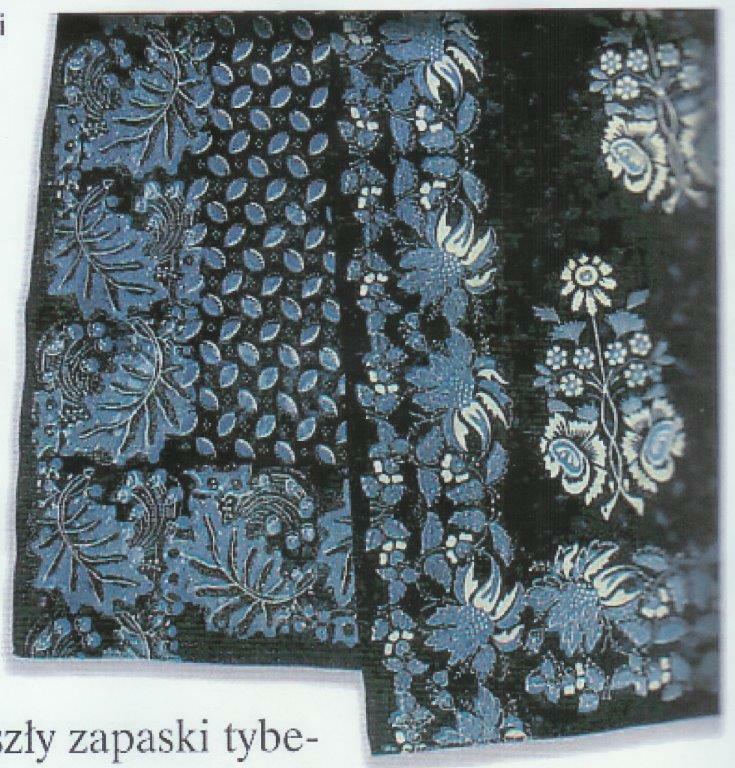 Professional dyers in Szczawnica, Stará Lubovna, Spišská Stará Ves, and Kežmarok produced batik dyed linen with white patterns on indigo or dark green. 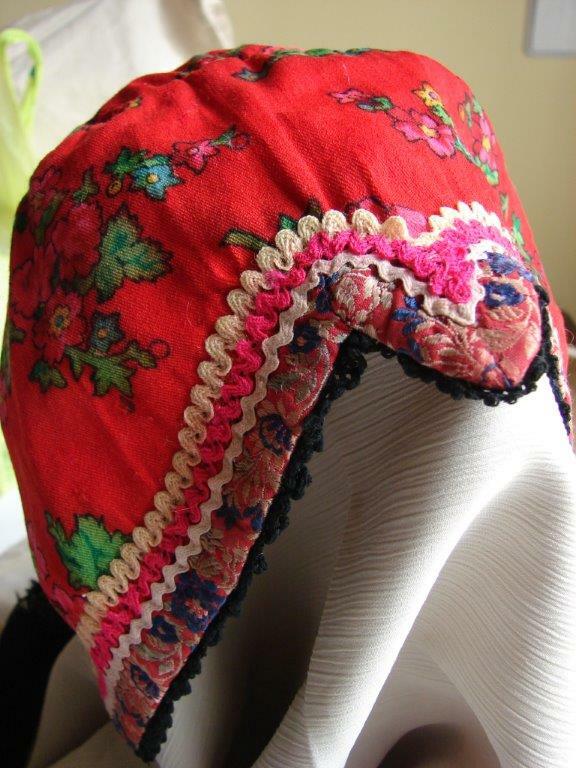 These were made into skirts and aprons. The skirts are made of cloth with small designs printed on, and the aprons with larger designs. Often the aprons had a border with a large floral design near the hem. Being commercially produced, these are worn over a rather large area. 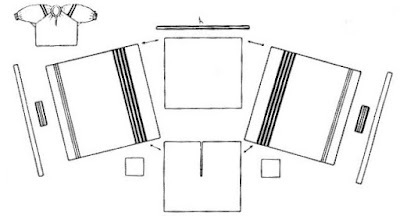 Often the resist dying process was done in two steps, with outlines of the design ending up white, and some fields being an intermediate blue, as to reach the full deep indigo color required several dips into the dye. 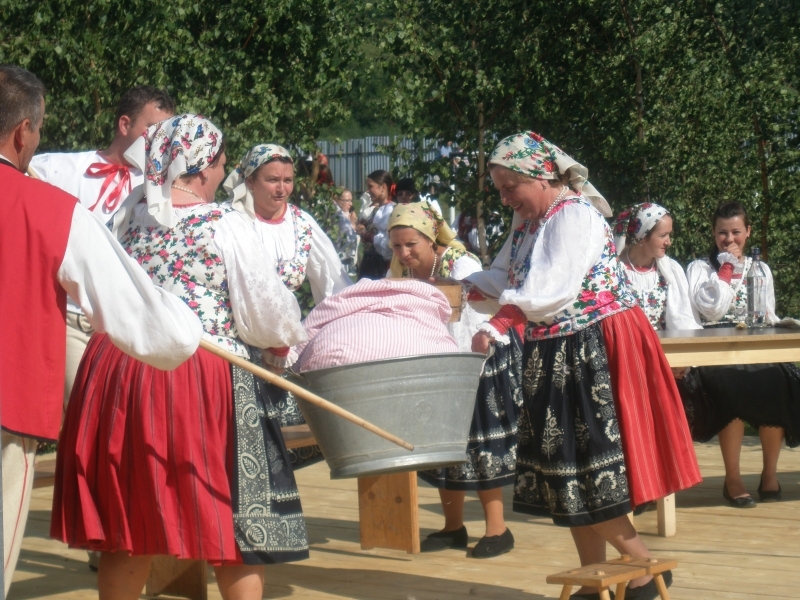 This Lemko woman from Bila Voda is wearing a complexly dyed apron with her everyday work clothes. her skirt is also of indigo resist dyed cloth. 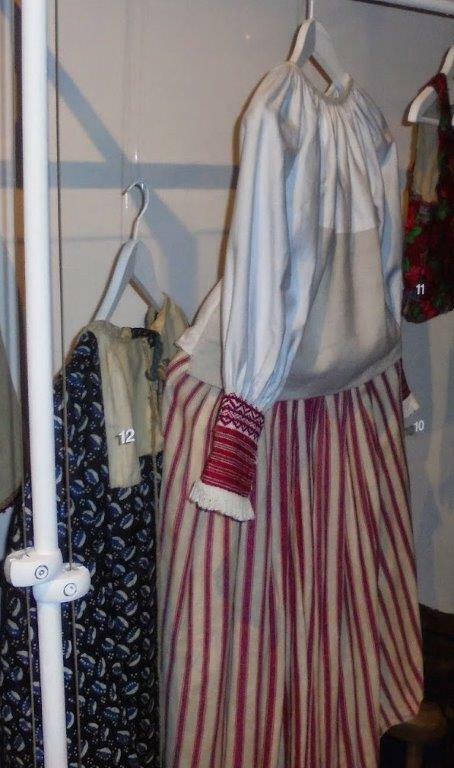 The skirts and aprons were originally quite long, but today are usually worn just below the knees. 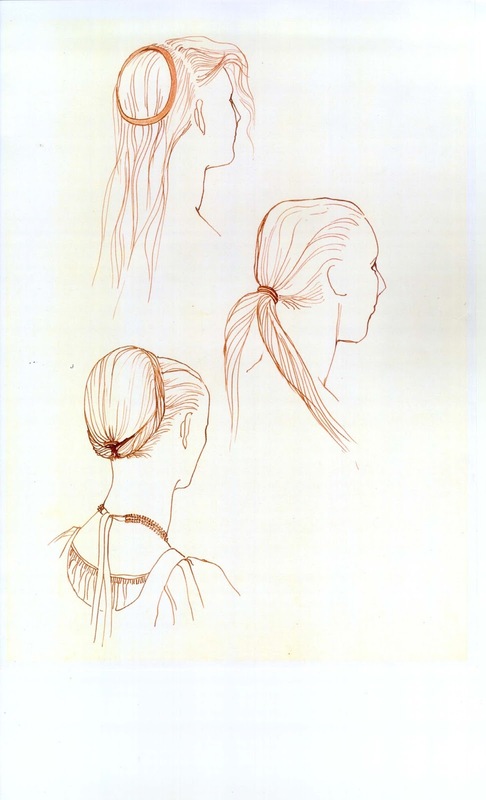 I personally find the longer ones to be more elegant and attractive, but this is typical in general for the 20th century. 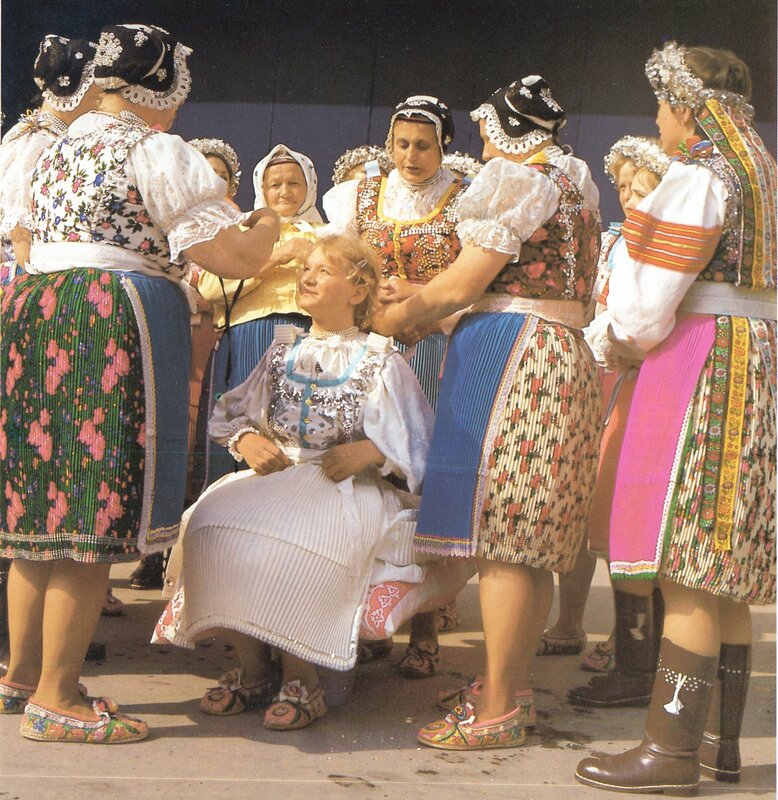 As is usual in Europe, married women by tradition kept their hair covered. 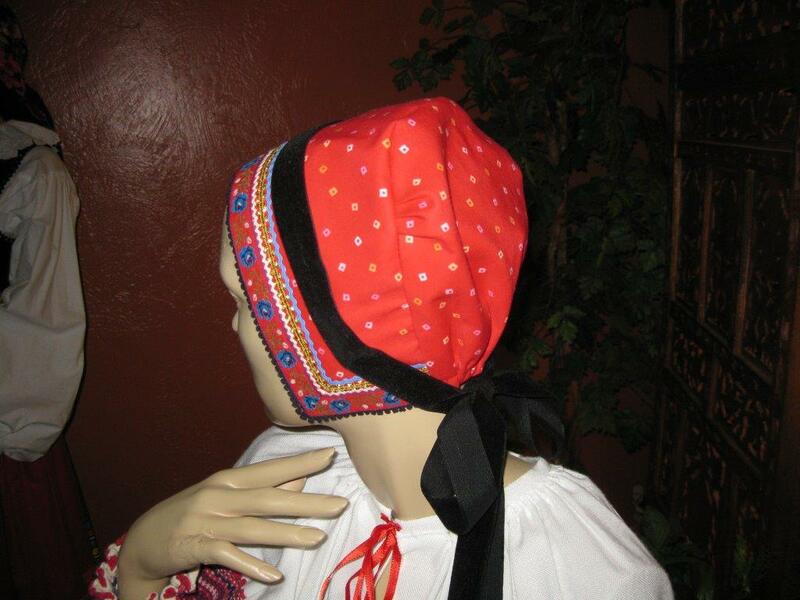 The cap used for this purpose is called chepets. 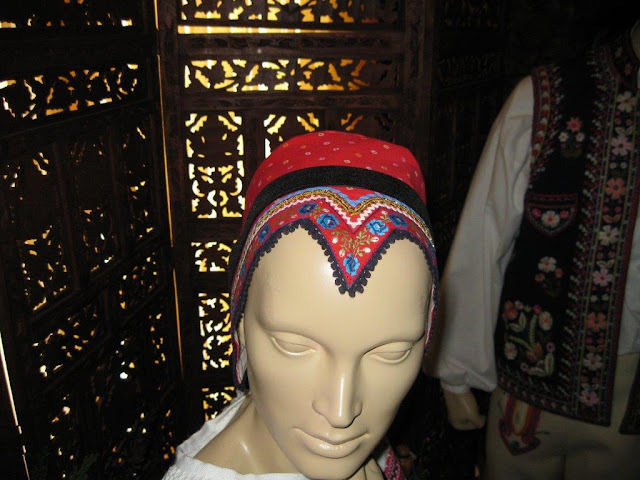 In this region, as in some neighboring areas in Slovakia, it was made with rectangular strip which framed the face, and a roundish area which formed the back. It has a distinctive point in front on the forehead. The front edge is often decorated with ribbon and trim. Take another look through the images in this article. 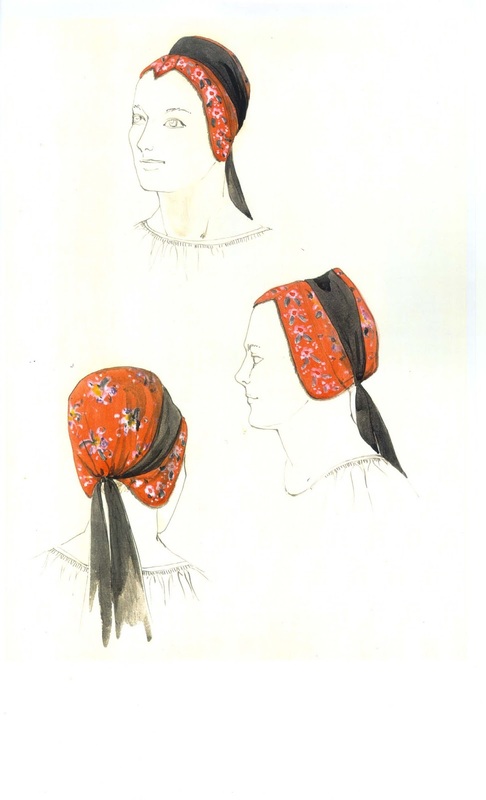 This was commonly tied about with a black ribbon in Sliakhtova, Szczawnica, Jarabina area, and Velyky Lypnyk. An image from Velyky Lypnyk. Originally over all of this region the hair was wound around a hoop of wood or wire covered with cloth khimlia, and this gave shape to the chepets and helped to hold it in place. 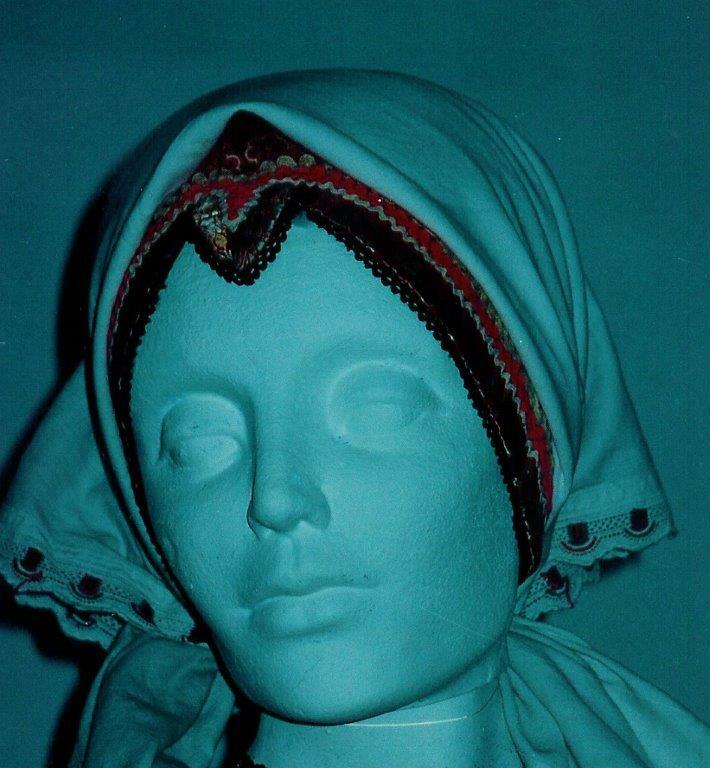 Kerchiefs are worn with or without the chepets by both married and single girls depending on the weather. 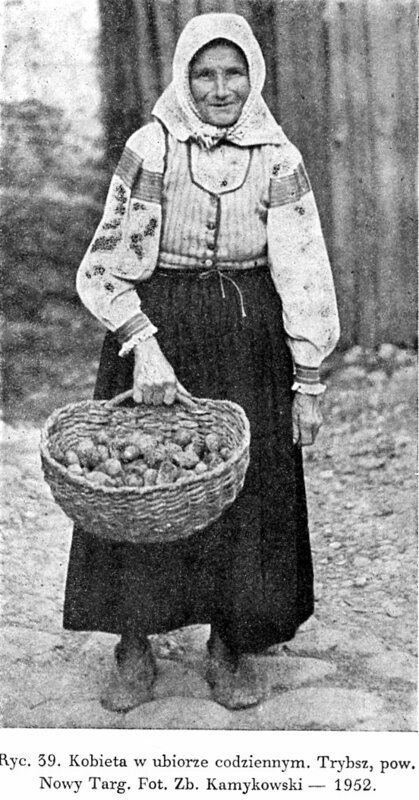 The chepets has gone out of use in some villages but has been kept in others. In good weather single girls would braid their hair. 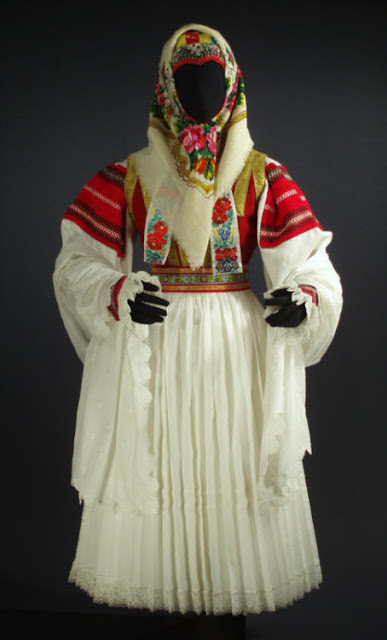 For festive occasions unmarried girls would sometimes wear a parta. 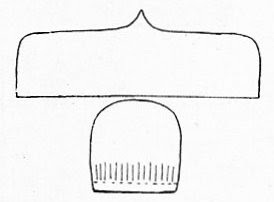 This is a crown type headdress that left the top of the head bare. 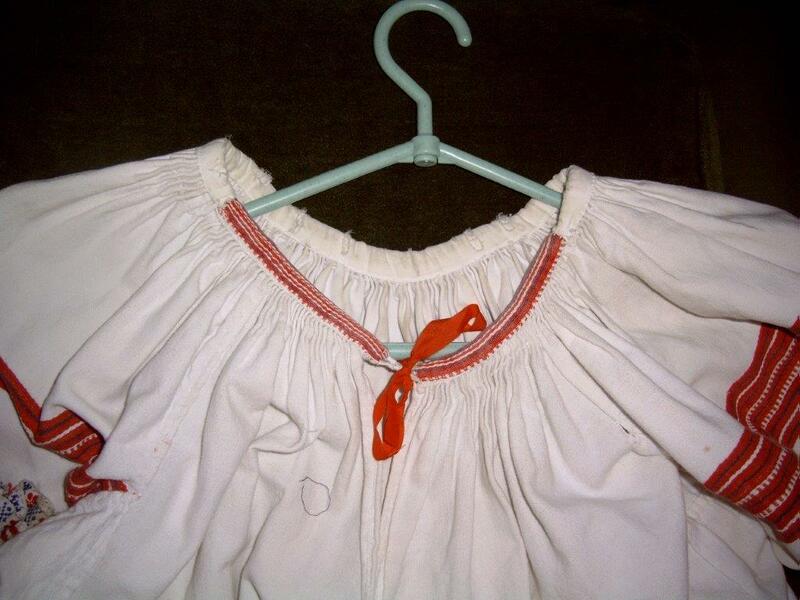 Sometimes it had ribbons hanging down the back. In some villages this was reserved for weddings, in others it was used for various special occasions, in others it was unknown. Here is an example from Litmanova. 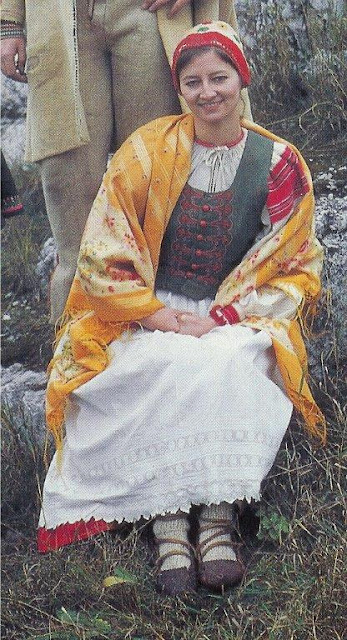 This woman is a popular singer in the area. Here is the wedding parta from Velyky Lypnyk. 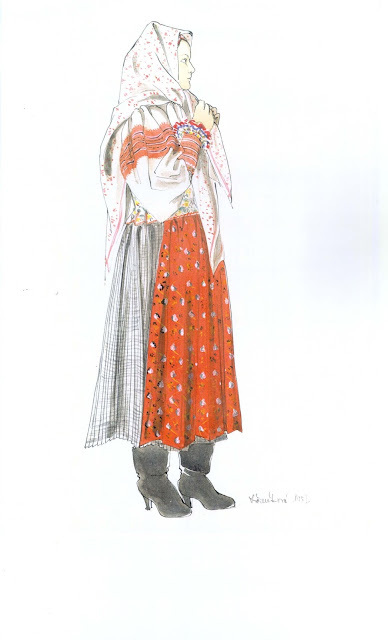 Jewelry, especially necklaces of red coral are worn to complete the costume. 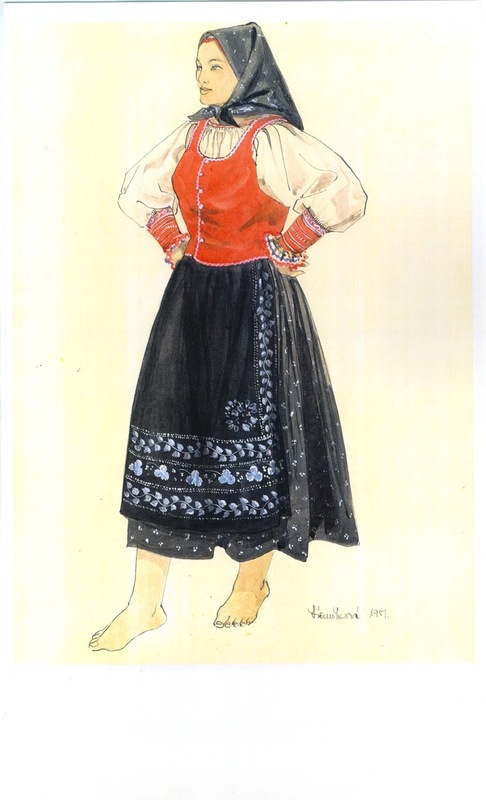 Women went barefoot, or wore moccasins kierpce, or boots if they could afford them. The source material is the same as the previous article, as this is a continuation of it. 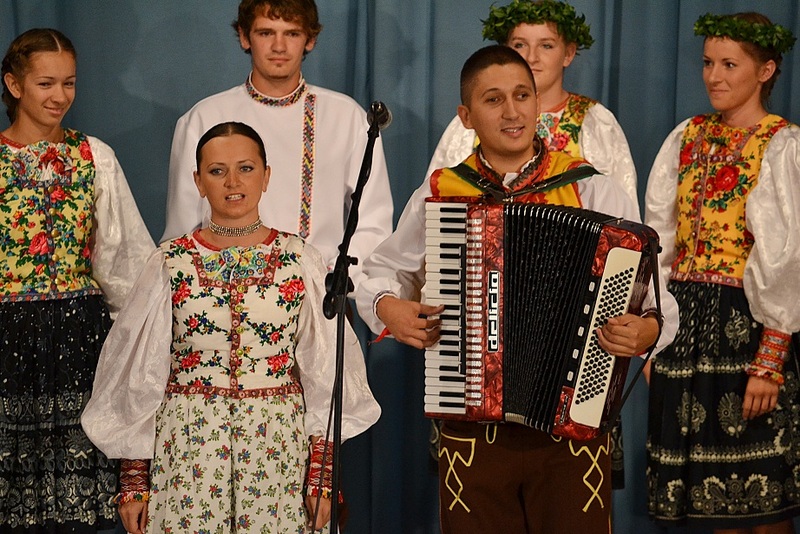 Here is a local group from Kroscienko performing in Szczawnica. 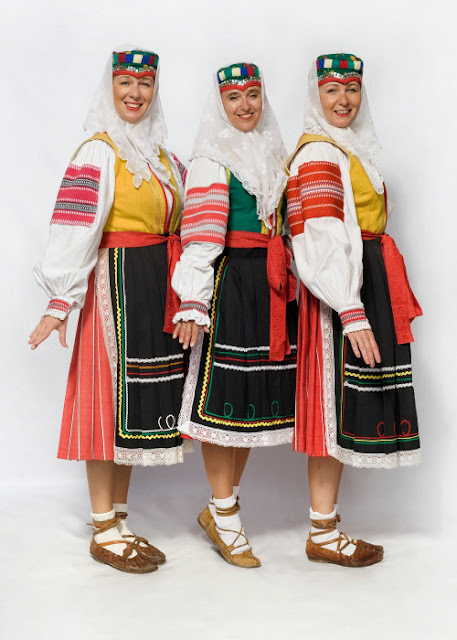 The one woman on the left is wearing this older style costume. The rest are wearing costumes more heavily influenced by Podhale.